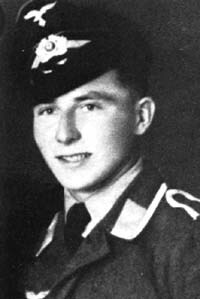 Reinhold Hoffmann was born on 9 August 1921 at Petersdorf in the Hirschberg region of Risengebirge. Hoffmann was posted to JG 54 based on the Eastern front at the beginning of 1942. Unteroffizier Hoffmann was assigned to 3./JG 54. He recorded his first victory on 27 July, when he shot down a Russian Yak-1 fighter. Victories came slowly with Hoffmann adding only one further victory in 1942. On 13 July 1943, he claimed three Russian Boston twin-engine bombers shot down to record his sixth through eighth victories. Hoffmann calimed three Russian Il-2 Sturmovik ground-attack aircraft shot down on 16 July (9-11). He recorded his 20th victory on 21 August. In 18 days from 20 October, Hoffmann claimed 27 victories, including seven enemy aircraft shot down on 21 October (33-39), eight on 22 October (40-47) and a further eight on 3 November (50-57). In spring 1944, Hoffmann was transferred to 9./JG 54 on Reichsverteidigung duties. He had 64 victories to his credit at this time. He quickly added three USAAF four-engine bombers to his tally. On 24 May 1944, Hoffmann attempted an emergency landing at Friesack following aerial combat. His Fw 190 A-8 (W.Nr. 680 184) “Yellow 3” crashed killing the pilot. Hoffmann was posthumously awarded the Ritterkreuz on 28 January 1945. Reinhold Hoffmann was credited with 67 victories. He recorded 64 victories over the Eastern front, including 23 Il-2 Sturmoviks. All three victories he claimed over the Western front were four-engine bombers. Additionally he claimed a number of tanks destroyed on the ground.